Multi-Level Pick Modules|E-Distribution Pick Modules|Picking Rack Sys. Optimize storage space and increase order throughput efficiency. Pick modules designed for full case, broken case and tote selection can increase picking rates and consolidate order selection in a condensed footprint; ideal for facilities handling high volume/high throughput SKU fulfillment. Pick module pallet racking systems move full pallets through the carton or case or pick channel then to dock or sortation often via conveyor. 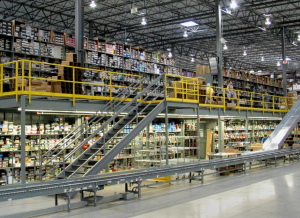 Pallet load aisle is accessed via lift truck allowing undisturbed order selection from the opposite aisle. E-Distri bution will custom design your module to effectively optimize space and improve picking productivity. Specifying new or quality pre-owned materials, we will combine an assortment of selective pallet racking, gravity flow options, conveyors and other material handling storage methods to meet your product flow goals.